If you have not read the article on Euro Dollar Price Action Biases At Weekly Extremes please do so as I will not go over the basics here again. Although similar to euro dollar, pound demonstrates subtle difference from euro in this set of statistics. 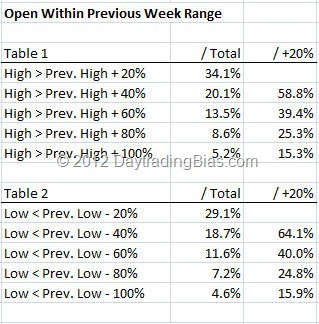 From Table 1, it is very clear the breakout method based on 20% breach of previous week high still works reasonably well but it is way weaker in comparison to euro. What it means is that although the weekly STOPD price level bias to reach 50% expansion is still there, it is not where the money is. 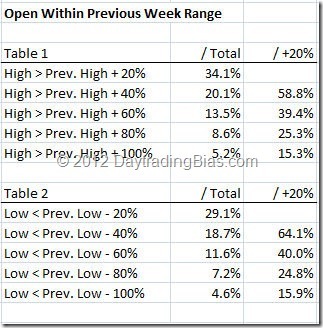 In Table 2, it is showing very stable downside bias just like euro. The very good stuff is here in the pip based bias like euro.